On February 27, 1984 the Michigan Panthers began the defense of their United States Football League Championship in a Monday night home game against the Chicago Blitz. Head Coach Jim Stanley’s team still had the key performers that fueled the 12-6 title-winning squad of 1983. WR Anthony Carter provided big-play ability as a receiver and kick returner and RB Ken Lacy had been the league’s third-leading rusher. QB Bobby Hebert was back behind center, although he held out and had only ten days of practice coming into the opening game. On defense, LB John Corker was coming off of a year in which he topped the USFL with 28 sacks, nearly twice as many as the runner-up. 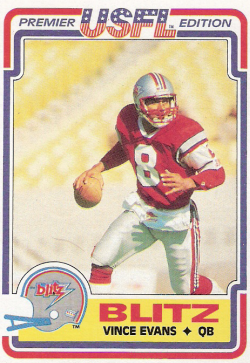 The Blitz was a very different club from the one that had also gone 12-6 under Head Coach George Allen in the inaugural season. The franchise was effectively traded, with Allen and the bulk of his veteran-laden roster heading to Arizona while the 1983 Wranglers were transplanted to the Windy City. Many of the former Arizona players were jettisoned, however. The new coach was Marv Levy and there were several NFL veterans that were acquired, most notably QB Vince Evans of the Bears. The state of the defense was a major concern coming into the opener against the Panthers. The Pontiac Silverdome was covered, but a blizzard outside held attendance down to 22,428 and caused many in the crowd to be late in arriving. The Blitz had the first possession and converted a third-and-five situation as Vince Evans threw to TE Mark Keel to advance to the Michigan 44. RB Larry Canada ran effectively and Kevin Seibel kicked a 41-yard field goal to give Chicago the early lead. The Panthers struck quickly in response. Following two strong carries by Ken Lacy, Bobby Hebert went deep to a streaking WR Derek Holloway, who got beyond the coverage and hauled the pass in for a 49-yard touchdown. Novo Bojovic added the extra point. Chicago responded with a drive of 80 yards in 10 plays that included key passes to WR Keith MaGee and another good run by Canada. It concluded with Evans leaping into the end zone from a yard out. Seibel kicked the point after and the Blitz was back in front by 10-7. The Panthers were driving as the opening period ended and, on the first play of the second quarter, Hebert threw to Anthony Carter for a 16-yard touchdown. Bojovic’s extra point put the home team ahead by four. The teams traded punts, with the Blitz getting the better of the field position and driving 59 yards in eight plays that culminated in a two-yard carry for a TD by Canada. However, an errant snap on the try for extra point kept the score at 16-14 in favor of Chicago. So it remained until the final seconds of the first half as the Panthers drove into scoring territory and Bojovic kicked a 39-yard field goal. Michigan led the back-and-forth game by 17-16 at halftime. The Panthers took the second half kickoff and again advanced into Chicago territory, but came up empty when Bojovic was wide to the left on a 33-yard field goal attempt. They got the ball back a short time later thanks to a fumble by the Blitz at their 31 yard line, but a holding penalty wiped out a good gain on a swing pass and Hebert was sacked on third down to take Michigan out of field goal range. The score remained unchanged as the contest moved into the fourth quarter. A punt by the Panthers that was downed inside the Chicago five yard line was negated by an illegal procedure penalty and the re-kick was blocked by RB Jim Stone. MaGee was unable to grab the bouncing ball as it skittered through the Michigan end zone, but the play still resulted in a safety that put the Blitz back in the lead by an 18-17 score. Chicago got good field position near midfield on the resulting free kick, but an Evans pass was intercepted by CB Oliver Davis, who returned it 23 yards. The Panthers moved backward rather than forward due to a holding penalty and a sack, forcing another punt. Two dropped passes caused the Blitz to have to punt with less than three minutes remaining to play and Carter returned Jeff Gossett’s 57-yard kick 13 yards. Hebert threw to Lacy for a 28-yard gain that nearly went the distance and Michigan then pounded straight away on the ground until a throw to RB Cleo Miller put the ball on the Chicago three with the clock down to 18 seconds. After one run into the line, Bojovic came in to kick a 20-yard field goal with no time remaining and the Panthers won by a final score of 20-18. Michigan led in total yards (397 to 275) and first downs (22 to 17), although time of possession was almost even. Both clubs ran the ball well, with the Blitz gaining 144 yards to 124 for the Panthers, but Michigan was much more successful through the air (273 to 131). Chicago turned the ball over twice, to none suffered by the Panthers, but Michigan was hurt by 12 penalties, at a cost of 79 yards, to seven flags thrown on the visitors. Bobby Hebert completed 20 of 34 passes for 296 yards and two touchdowns while giving up no interceptions. Ken Lacy rushed for 98 yards on 16 carries and caught four passes for another 58 yards. Anthony Carter had 7 pass receptions for 108 yards. For the Blitz, Vince Evans was successful on 16 of 32 throws for 134 yards and was picked off once. Larry Canada gained 84 yards on 12 rushing attempts and RB Glenn Ford contributed 41 yards on 8 carries. Mark Keel and WR Marcus Anderson each had five catches, for 61 and 40 yards, respectively. 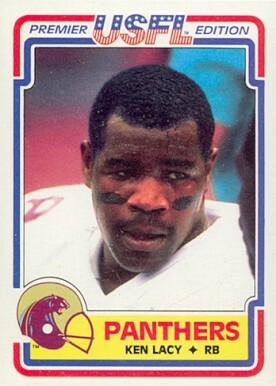 Following the successful, if unsteady, start, the Panthers won their next five games before disaster struck when Anthony Carter was lost for the year with a broken arm, the first of several key injuries. Michigan promptly dropped four straight contests and barely made it into the postseason as a second place Wild Card with a 10-8 record, losing in the first round to the Los Angeles Express in triple overtime. Chicago never got on track, struggling to a 5-13 tally and placing last in the Central Division.